See what an Influencer Screening can do for your release. Our carefully curated relationships with influencers and outlets are what push us head and shoulders above the rest, generating fantastic results for our clients. With an exclusive Influencer screening for the theatrical release of Mom and Dad, we were able to get influencers raving about the film, generating a reach of 2.1 Million to key target audiences. We carefully curated key film and lifestyle influencers to shout from the rooftops about the theatrical release of Mom and Dad. We pulled out all the stops, from a special screening experience, exclusive merchandise and amazing key assets that Influencers couldn’t help but share with their audience. Results / Stats: We generated a completely organic campaign which had fantastic coverage and reach - with a whopping 3.2 Million Timeline Deliveries generated on Twitter alone! With an accumulated following of 1.1 Million, our influencers shouted from the rooftops about this release, including names such as Mark Ferris (579k Followers). No stone was left unturned in our quest to generate as much coverage as possible in the lead-up to release, with content carefully created through official channels to create buzz and excitement. With studies revealing 40% of Twitter users have made a purchase as a direct result of a Tweet from an influencer, there has never been a better time to get social influencers raving about your releases. 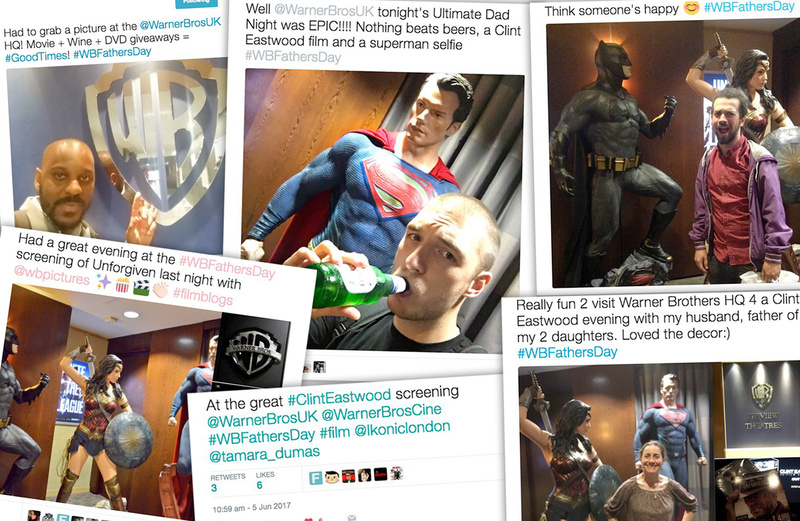 Brief: Our highly successful Warner Bros. Father’s Day screening returned for the release of the Clint Eastwood 40 Film Collection, positioning the set as the perfect gift for Dad. Results: Influencers got to show just how much their Dad meant to them with a well deserved ‘Dad Day’. Content was high in sentiment, providing emotive and engaging posts which positioned the Clint Eastwood 40 Film Collection as the gift to show how much you love your Dad this Father’s Day. Gift guides placements, positive reviews and features were all generated as a result of the screening, generating 1.1 Million Timeline Deliveries with a reach of 594k overall on social media. With a dedicated, experienced team and an extensive database of contacts, we match the right Influencers to your campaign (from parenting, lifestyle, kid, horror and film influencers to everything in between), carefully curating relationships to get the best results for your release. Whether you have a theatrical, home ent. or special anniversary celebration, we will work with our unique database of contacts to deliver fantastic results for your release. Contact Emma to find out more.